The Price Ratio (or relative strength - comparative) serves a similar purpose to Price Comparison - it compares the performance of one stock relative to another (or to an index). Some traders use the Price Ratio as a general tool to select outperforming stocks. Price Ratio is calculated by dividing the closing price of the first stock by the second. Price Ratio is adjusted so that the indicator line always starts at zero on the left of the chart. Price Ratio (Unadjusted) makes no such adjustment and simply displays the raw ratio of closing price between two securities. 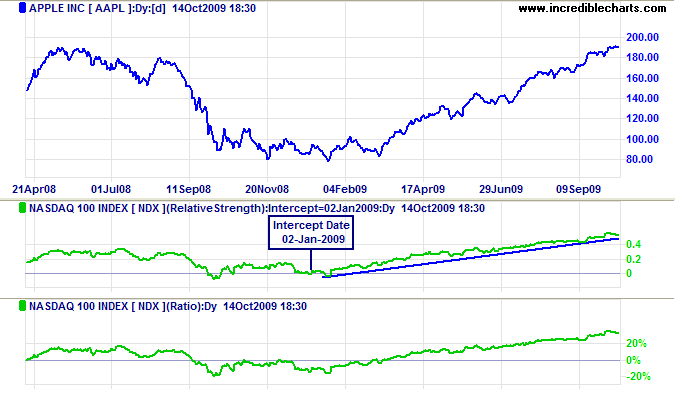 Relative Strength is similar to Price Ratio except that you are able to set the intercept date (at which the indicator line is equal to zero) to any date on the chart for which there is data history. If left blank, the date will default to the earliest available date for the two data histories. The advantage of Relative Strength over Price Ratio is that the line does not reset every time you vary the chart time period. This is important if you are going to draw trendlines or captions. The Relative Strength indicator is not identical to the Relative Strength on Mansfield Charts — popularized by Stan Weinstein in his book Secrets For Profiting In Bull And Bear Markets. It is, however, very similar and can be used with Weinstein's long-term breakout system. Enter the Start Date or leave as Default (the intercept date will be taken as the earliest date shared by the two stocks). The Price Ratio is calculated using the ratio of closing price to that of another security, on the first day of the chart. This means that the starting point of the Price Ratio will vary according to the Time Period selected. The line may appear to move if you change time periods, but the slope remains the same. Settle on one or two standard time periods to be used when viewing Price Ratios (eg. 3 Years - Weekly; 6 Months - Daily). Calculate the Inverse Ratio on Day 1: DJI divided by IBM. The Price Ratio then reduces the start to zero by subtracting 1 (from step 3). Note: Metastock ® use a different formula to normalize to zero. They calculate the ratio in step 2 and then subtract the ratio on day 1 from each subsequent day. The results are similar.